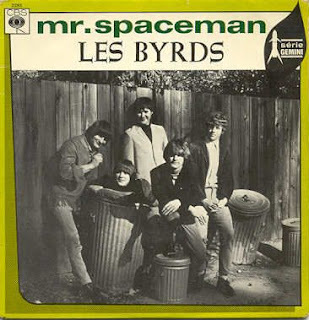 For me this was always the consummate Byrds track, given as it is one of the earliest outriders, 1966, for their later more overt country influences. Undoubtedly a yee-haw hayride of a tune, yet coupled with, literally, spaced out lyrics, it was ideal for the time; the Byrds still in their first flight of success, together with the race for the moon being in full pelt. Too 'and western' for the UK charts it bombed in my home-land, but did better at home, no little assistance coming from the phased psychedelia of the instrumental middle 8. Indeed it is still argued as to whether it was forerunner more of psychedelia or of country-rock. Both, say I. The video represents it's first airing, on the Smother Brothers Show, with a 4 member band, the legendary rotating door of this band already in full swing. Whilst writer of the song and singer Jim (later Roger) McGuinn is clearly still present, along with Chris Hillman and Michael Clarke, on 12-string rickenbacker, bass and drums respectively, David Crosby is conspicuously absent for the first time. Especially as he was, arguably, the biggest space cadet and sci-fi freak in the band. And Gene Clark, in or out of the band depending on whether there was a plane trip expected, and who was nominally only a supporting musician for the recording, is there, pretending to play Crosby's guitar. It seems certain his is the key second voice in the harmony however, miming though they all are. A memorable tale from the time was that the band famously took out a million dollar insurance policy, with Lloyds of London, against being abducted by aliens. They didn't of course. And weren't. Although, with Jim to Roger, who's to say? It remained a staple of live performances over the years, as members came and went, McGuinn the sole staple, but the style of the song fitting well with the directions driven by later members Gram Parsons and Clarence White. There is a nice video filmed in the desert featuring the former, but with the original recording still the one playing. Various reunions of the earlier line-up also featured it, as have various off-shoots of the original band, notably the equivalently ever changing Flying Burrito Brothers, who probably featured every other living Byrd, McGuinn apart, at some stage. McGuinn also trots it out at the drop of a hat, it often being the song chosen should he make a guest appearance, as he here does with Wilco. Don’t feel bad if you never heard of this one. Two Little Men in a Flying Saucer is one for Ella Fitzgerald completists. It comes from 1951, fairly late in the swing era. The soldiers have been back from World War II for some time now, and rock and roll will be unleashed on an unsuspecting world very soon. The songwriters on this one were Arthur Pitt and Elaine Wise. I could find no other credits for Pitt, and Wise wrote two other songs also recorded in 1951, and then disappeared from pop music history as well. Having said all that, this is a fun song, and Fitzgerald sings it with the perfect light hearted tone. Before we are done with our Aliens theme, we may well hear a song that takes the concept of humans seen through alien eyes far more seriously. It’s a device for criticizing humanity that can be very powerful. But Two Little Men has fun with the idea. Not knowing the rules of baseball, for example, these planetary visitors simply shake their heads in a non-judgemental way and leave Earth. There is a little gag about politicians here, but it is nopartisan and played for laughs. I am not going to tell you that this is classic Ella Fitzgerald, but it is a fine example of her playful side, and it makes me wonder why there weren’t more songs recorded by Pitt and Wise. In 1976, it seemed that Beatlereunionmania was rampant. Lorne Michaels famously had offered The Beatles $3,000 to reunite on Saturday Night. Later that year, Capitol Records, The Beatles’ label, released an album of Beatle-ish pop, 3:47 EST (called Klaatu in the US), from a band called Klaatu, with no identifying credits, and rumors began to spread that Klaatu was, in fact, The Beatles. If anything, Capitol did nothing to squelch the rumors, because they led to increased sales of albums from an unknown band. Of course, Klaatu wasn’t The Beatles; they were a Canadian band, heavily influenced by The Beatles, and named after the extraterrestrial character in the film The Day the Earth Stood Still, consisting of John Woloschuk, Dee Long, and Terry Draper. None of whom were ever in The Beatles. If you are interested in reading more about the whole rumor thing, which is amusing mostly due to the level of analysis that people went through to try to convince themselves that there was actually a secret reunion (including, for example: “While there are 8 trees pictured right at the very bottom of the front cover of the band's first album, only 7 have their roots showing. There are 7 letters in the name Beatles”) click here or here. The idea for this track was suggested by an actual event that is described in "The Flying Saucer Reader", a book by Jay David published in 1967. In March 1953 an organization known as the "International Flying Saucer Bureau" sent a bulletin to all its members urging them to participate in an experiment termed "World Contact Day" whereby, at a predetermined date and time, they would attempt to collectively send out a telepathic message to visitors from outer space. The message began with the words..."Calling occupants of interplanetary craft!" As far as we know, the message didn’t result in any alien contact. Or at least, that’s what they tell us. “Calling Occupants” definitely has a Sergeant Pepper’s feel, but also some more prog influence, with heavy use of Mellotron and synthesizer. Also, drummer Draper was reportedly a fan of the first King Crimson drummer Michael Giles (as well as Ringo), and some of the drumming sounds a bit like “In The Court of The Crimson King.” A single version, edited to 3:23, nosed around the bottom of the charts. Klaatu’s next album, Hope, was a concept album about aliens, and their next three albums moved more toward pop and away from psychedelic experiments. By 1982, Klaatu was essentially defunct, except for a few small reunions and the creation of a record label to re-release their material. Now, if you were alive in 1976, and were asked to name a musical act that was the opposite of adventurous psychedelia and prog, you might have suggested The Carpenters, the sibling duo with the squeaky clean reputation, and an output of mostly sugary ballads and bland pop, enhanced, though, by Karen Carpenter’s voice, and her brother Richard’s arranging skills. So, it was a bit surprising when they decided to cover “Calling Occupants.” Their version, released in 1977, a lush, orchestral pop song, featuring over 150 musicians including the Los Angeles Philharmonic Orchestra and a choir, was originally over 7 minutes long. As a result of their popularity, and the coincidentally recent release of Close Encounters of the Third Kind, a film about space travel, The Carpenters’ cover, edited down for single release, was more successful than the original. Not only did they do a great job, it was such a stretch for them, they were really stepping out of their comfort zone and doing what could possibly be described as prog rock although I like to call it progressive pop. Also, it probably made him a few bucks, which couldn't have hurt, particularly since he wasn’t a Beatle.